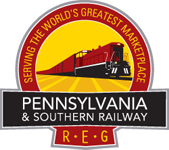 The Pennsylvania & Southern Railway serves the Cumberland Valley Business Park – a 1,200-acre logistics center featuring over one million square feet of space and hundreds of acres of industrial zoned land. The Park is strategically located along the rapidly growing, logistics-centric I-81 corridor between Harrisburg, Pennsylvania, and Hagerstown, Maryland and is in the heart of the Mid-Atlantic agricultural belt. Pennsylvania & Southern Railway crews can provide multiple daily switches to all customers allowing very efficient utilization of rail cars and enabling customers to limit (if not completely avoid) demurrage costs. Cross dock, warehousing, bulk products transloading, reloading, and on-site trucking from industry-recognized 3PL partners can efficiently handle a wide range of products: agricultural commodities, steel, lumber, paper, machinery and heavy equipment, a wide variety of non-hazardous bulk products (dry and liquid), and more. 30 miles of track maintained to FRA Class 2 standards and capable of handling loaded rail cars with a gross weight of up to 286,000lbs. Routes to and from the Pennsylvania & Southern Railway via CSX Transportation are cleared for shipments with a gross weight of up to 286,000lbs. 24 food and paper grade buildings. 1.5 million square feet of space under roof. Over 1 million square feet of additional space proposed. Approximately 150 car spots for bulk products transloading. 700 spots for car storage. Warehouse / cross-dock / reload and laydown space controlled by the Pennsylvania & Southern Railway available for lease or use. Industrial property available for development. The Pennsylvania & Southern Railway connects with CSX Transportation. The Cumberland Valley Business Park is located at the intersection of Routes 997, 433, and 11. It is only 4 miles from Interstate 81, Exits 20 and 16. I-81 provides quick travel times to I–76 and I–78 in Pennsylvania and I-70 and 270 in Maryland. The Park is in close proximity to the major logistics centers located in the Carlisle, PA, region, the Norfolk Southern intermodal terminals in Greencastle and Harrisburg, and the CSX intermodal terminal in Chambersburg. The Port of Baltimore is only a 2 hours away by highway.